Recent reports1 speak to record low salmon runs in the Sacramento River Valley, including spring-run Chinook in the Feather River. In May, I described the Feather spring-run population dynamics.2 The run is primarily a hatchery run that benefits from trucking to the Bay. The 2017 Feather spring-run stands out as poor in the long term patterns (Figures 1 and 2). A lot happened this past year in the Feather with many ramifications to the spring run. Poor flows and water temperatures in late spring likely contributed to the poor run compared to wet year 2011 (Figures 3 and 4). High water temperatures (>20oC; 68oF) in 2017 likely hindered the late spring component of the adult spring-run migration and subsequent over-summer survival. Poor conditions in drought years 2014 and 2015 during the winter-spring rearing season likely also contributed by reducing survival of hatchery smolts released in 2014 to the river (0.16%3) compared to those trucked to the Bay (0.24%). So how might future runs be improved? Maintain water temperature during the spring adult migration within the 20oC water quality standard. Often, Verona through lower Feather River water temperatures exceed 20oC in spring, putting adult spring-run at risk. Water temperatures should not be above 18oC (65oF). Finally, given the poor conditions from 2015 to 2017, and thus expected poor runs in 2018-2020, every effort need be made in these coming years to turn around the downward trend if the Feather spring run is to remain viable. The run remains an essential component of the Central Valley ESA-listed spring-run Chinook salmon ESU (Evolutionary Significant Unit). Figure 1. 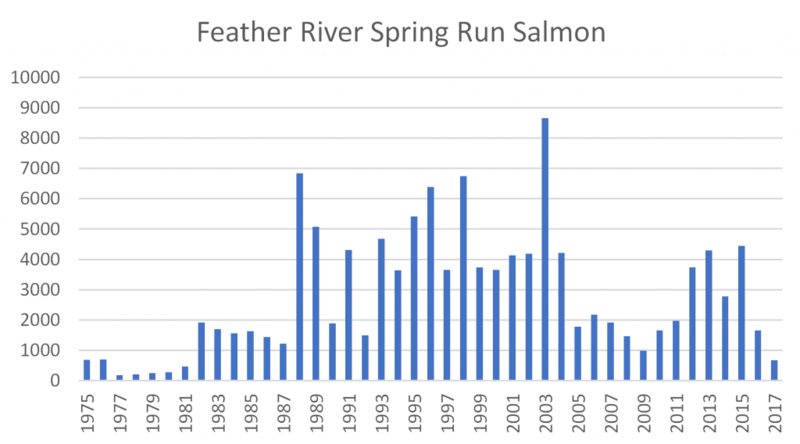 Feather River spring-run Chinook salmon escapement (run size) from 1975-2017. Figure 2. Recruit-per-spawner relationship for Feather River spring-run salmon (log10-2 transformed) for years 1978-2017. 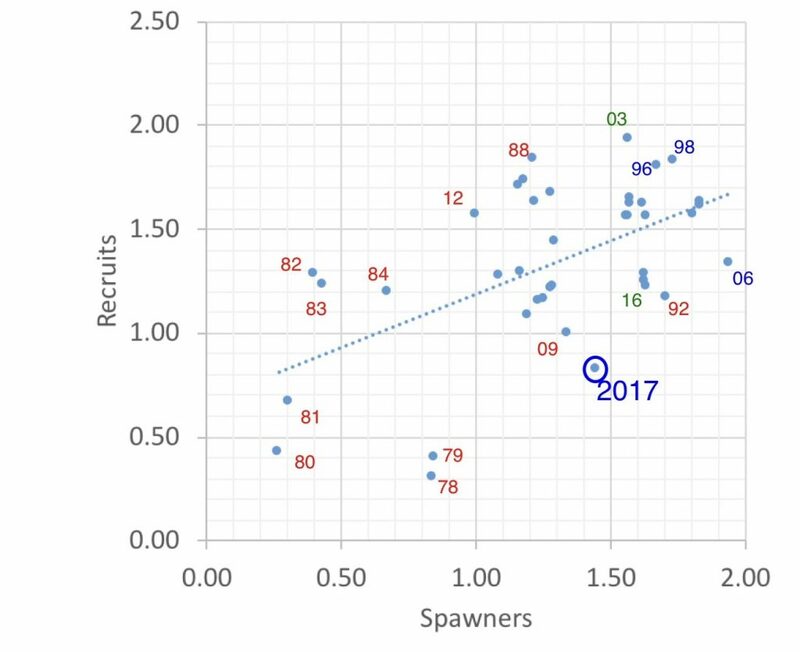 Note that 2017 represents recruits from 2014 spawners. Figure 3. 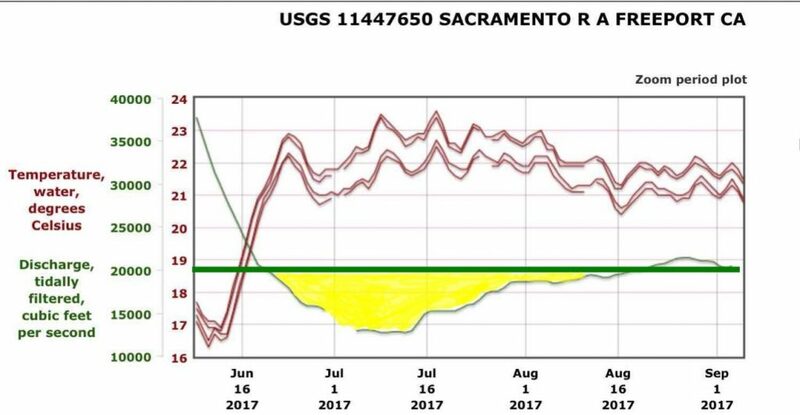 Water temperature and river flow in lower Sacramento River at Verona just downstream of mouth of Feather River in spring 2017. Source: USGS. Figure 4. Water temperature and river flow in lower Sacramento River at Verona just downstream of mouth of Feather River in spring 2011. Source: USGS. 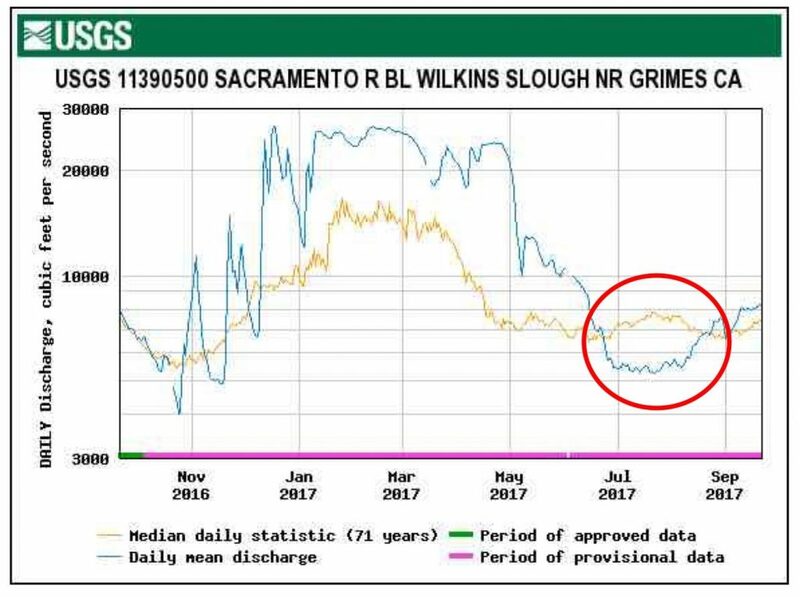 In a recent post, I discussed ways to increase returns/survival of the Coleman (Battle Creek) Hatchery produced smolts released to the Sacramento River and the Bay. In this post I focus on ways to improve returns/survival of young salmon produced at the Oroville (Feather River) Hatchery. Trucking smolts to the Bay in drier water years and releasing spring flow pulses in wetter years remain the key management actions for increasing the contribution of hatchery salmon to coastal and river fisheries. Timing of releases is also critical. While overall returns are highly influenced by ocean conditions, active management by hatchery managers (trucking, barging, and timing of releases) and water managers (flow pulses) are important tools in maximizing the contribution of hatchery smolts to salmon populations. In a prior post, I discussed general means of increasing hatchery contributions. In that post, I presented a summary of Oroville (Feather River) Hatchery returns for brood years 2008-2012 (Figure 1). Return rates were highest for brood years 2009-2011, with winter-spring normal-wet year designations (water years 2010-2012). Brood year 2008 and 2012 smolts were released in winter-spring of drought years. In this post I provide information from earlier brood years. This information supports a more specific strategy to increase the Feather River hatchery program’s contribution to California fisheries. Below, I add a summary of returns from selected brood years (2002-2007). Hatchery smolt returns for brood year 2002 were good, with hatchery releases in the above-normal water year 2003. The good adult return performance is generally attributed to good river and ocean conditions in 2003. 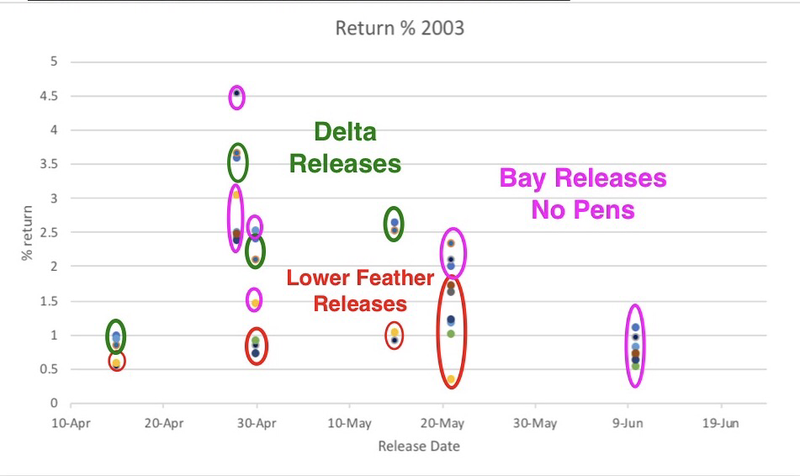 A closer look at release return rates (Figure 2) shows generally good returns (>1%) reflecting the good river and Delta conditions in 2003 and good ocean conditions, at least in 2003. 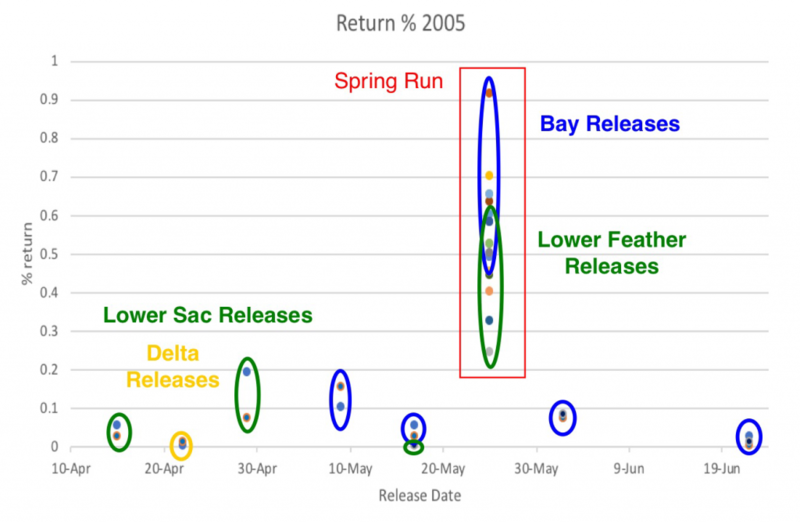 Some return rates were very good (>2%), including late April to mid-May returns for Delta and Bay (non-pen) releases. The higher return rates occurred coincident with a late-April through mid-May flow pulse (Figure 3). 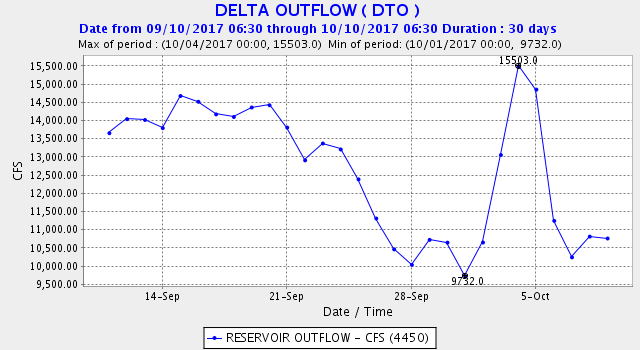 During the flow pulse, releases to the Delta had return rates in the same high range as Bay releases. 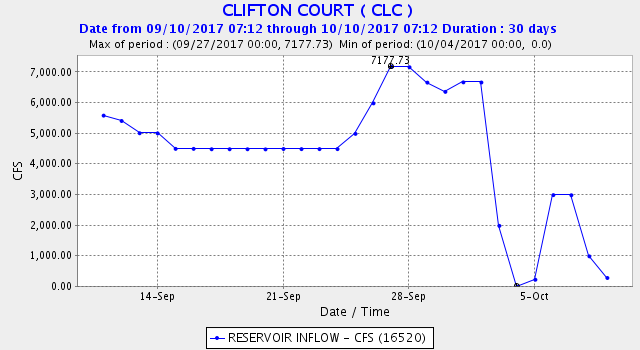 Most of the river releases had low rates of return (<1.0%) before the flow pulse; while during the pulse, most rates were 1.0-1.7%. Hatchery smolt returns for brood year 2003 were mediocre. The juvenile salmon were released in the below-normal water year 2004. The poor performance is generally attributed to poor river conditions in 2004 and poor ocean conditions in 2004-2006. A closer look at release return rates (Figure 4) shows few good returns (>1%); this reflects the poor river and ocean conditions. 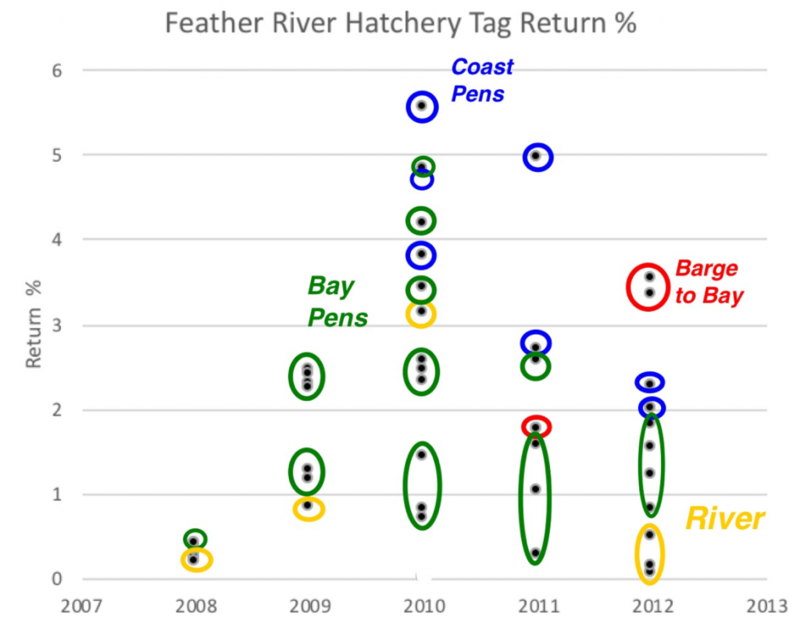 Some Bay-release return rates were good (>1%). The higher Delta-release and Bay-release return rates occurred with higher early-to-mid April flows (Figure 5). May river releases had near-zero rates of return. 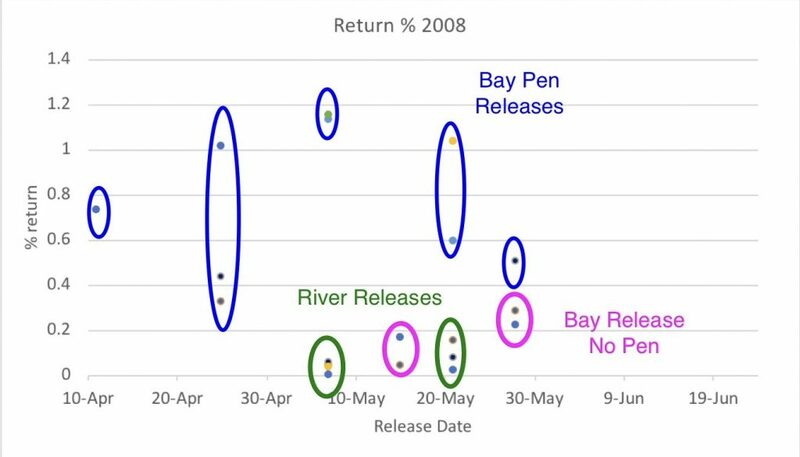 Overall, Bay-release return rates (all with net pens) far outperformed Delta and river releases, reflecting the advantage of bypassing poor river and Delta conditions after mid-April in 2004. Figure 4. Feather River hatchery fall-run salmon return rates by release method for brood year 2003 (release year 2004). Hatchery smolt returns for brood year 2004 were poor despite the fact that juvenile releases took place in the above-normal water year 2005. The poor performance is generally attributed to poor ocean conditions in 2005-06. 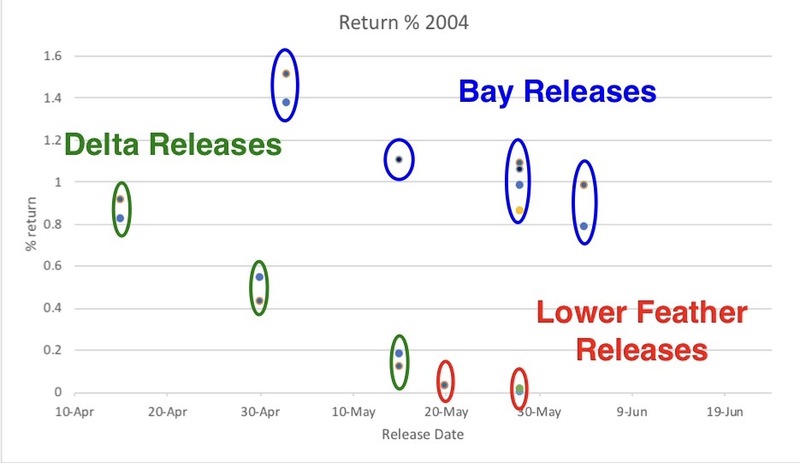 A closer look at release return rates (Figure 6) shows poor returns (<1%) reflecting the poor ocean conditions. Some return rates were extremely poor (<0.01%). Compared to good return rates of 1-4% in other years (see Figure 1), these rates are extremely low. 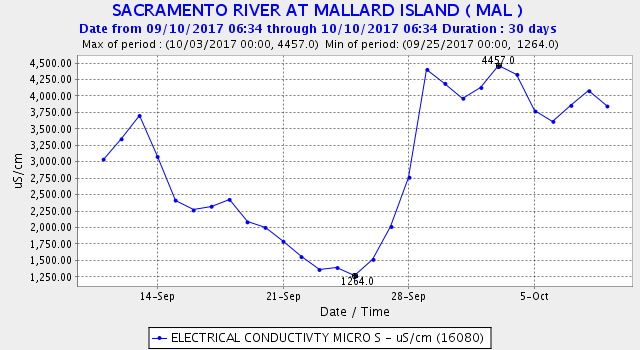 For example, a normal annual release of 4 million smolts from the Oroville Hatchery would return 40,000 adults at 1% and only 400 at 0.01%. A closer look at Figure 6 release rates and water conditions in spring 2005 (Figure 7) indicates higher survival of releases into the Feather River and Bay during the May flow pulse, although Bay release rates (all net pens) averaged twice those of river releases. Figure 6. Feather River hatchery fall-run salmon return rates by release method for brood year 2004 (release year 2005). Brood Year 2005 releases in the very wet year 2006 had return rates that were very poor for both Delta and Bay releases, reflecting very poor ocean conditions (no chart shown). Delta releases averaged 0.1 % return, with Bay releases (no pens) only slightly higher at 0.2 %. These low rates, along with similar low rates from other Central Valley hatcheries, contributed to the salmon fishery collapse of 2008. Hatchery smolt returns for brood year 2006 were poor (Figure 8). The poor performance is generally attributed to poor river, Delta, and Bay conditions in the 2007-2009 drought, and mediocre ocean conditions. Many return rates were very poor (<0.1%). Some of the higher returns came from earlier releases (April), when Delta inflow was higher and water temperatures were lower (Figure 9). Figure 8. Feather River hatchery fall-run salmon return rates by release method for brood year 2006 (release year 2007). Hatchery smolt returns for brood year 2007 were generally poor (Figure 10). The poor performance is generally attributed to poor river, Delta, and Bay conditions in the 2008-2009 drought, and relatively poor ocean conditions, except in 2010. Many return rates were very poor (<0.1%). 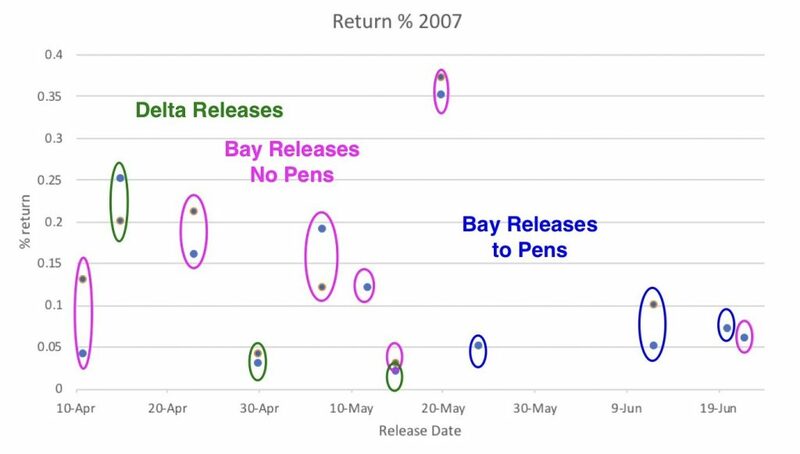 Some Bay pen release return rates were good (>1.0%). Most of the lower return rates came from May river releases under poor conditions (Figure 11). Bay pen release return rates were generally substantially higher than non-pen Bay releases during May. Figure 10. Feather River hatchery fall-run salmon return rates by release method for brood year 2007 (release year 2008). River, Delta, and Bay conditions. Release location – Feather River, lower Sacramento River below mouth of Feather, north Delta, San Pablo/North Bay, and coastal bays north and south of San Francisco. Release method – trucked to river, Delta, or Bay boat ramps for direct release, trucked to acclimation pens in Delta or Bay, or trucked to feeding pens in coastal bays. Age/size of released smolts – February through July: early spring smolts, normal spring smolts (mid-April to mid-May), and advanced late spring smolts (mid-May to mid-June). Late spring releases are limited to the Bay because the rivers and Delta are too warm. Date of release – winter release of hatchery fry and fingerlings, spring release of smolts, late spring and summer release of advanced smolts. The following actions by hatchery and resource managers can enhance returns to a limited extent, depending on conditions. Trucking to lower Sacramento River, Delta, Bay, or coastal bays. Acclimating trucked fish in pens prior to release. Timing releases to best available release conditions. Enhancing release conditions (e.g., flow pulses). Barging smolts to the Bay from the lower Feather River. The most problematic situation for managers is improving returns in years with very poor ocean conditions (e.g., 2006). Under such conditions, trucking to Bay pens appears to be the best option and is the present management scheme. Barging smolts to the Bay may provide an added benefit. Under good ocean, Bay-Delta, and river conditions, releases to river and Delta locations with a supplemental flow pulse may provide good returns. Releases to lower Feather River locations generally provide poor returns regardless of conditions. A further enhancement option is rearing hatchery fry in floodplain rice fields adjacent to the lower Feather River. Besides the obvious benefit of “natural” rearing, high growth would allow smolt release at least a month earlier than hatchery smolts. Such natural smolts could be trucked or barged to the Bay from near the rearing sites. A return rate of 5-10% from such smolts is conceivable, with the potential of contributing substantially to coastal and inland salmon fisheries. The population dynamics of the San Francisco Bay-Delta estuary’s endangered Delta smelt can be viewed using patterns in annual indices of their abundance published by the California Department of Fish and Wildlife (CDFW). Indices of abundance are available from the Fall Midwater Trawl and Summer Townet surveys over the past five decades. Since Delta smelt have a short one to two year lifespan, they readily lend themselves to spawner-recruitment (S/R) analyses that help define the population dynamics of the species. This report employs S/R analyses to review long-term trends in the population indices of the Delta smelt. The analyses support the hypotheses that abundance (adult numbers) and recruitment into the adult population are primarily controlled by the numbers of adult spawners, adjusted by wet-dry year differences in production of juveniles. In other words, the population abundance from year to year is determined by the number of eggs laid each year and the survival of each egg cohort to adults a year later. 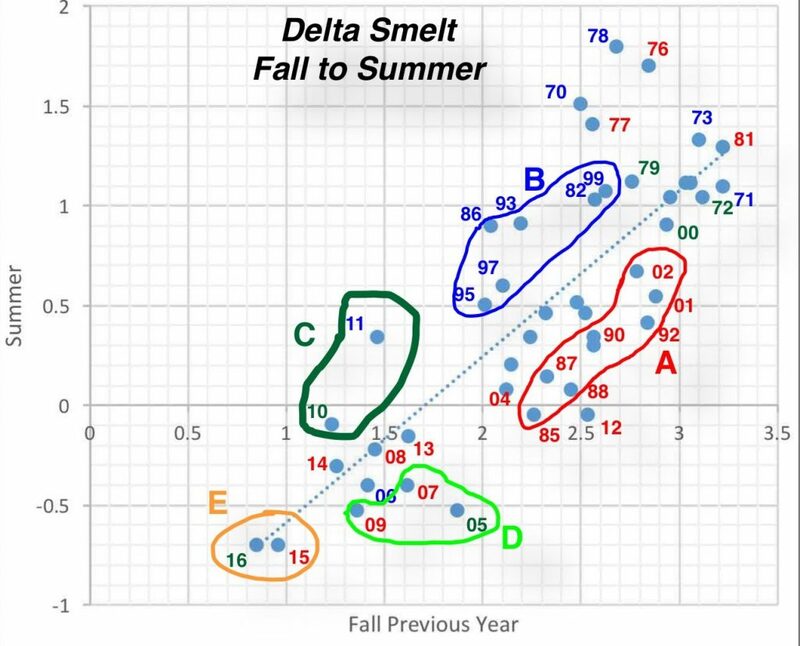 The long-term trends in Delta smelt reflected in the CDFW annual indices of summer and fall survey catch show dramatic declines over the past five decades (Figures 1 and 2). In the Summer Townet (STN) Index (Figure 1), the most obvious population declines are in the early 1980’s and the mid-2000’s. The Fall Midwater Trawl (FMWT) Index (Figure 2) highlights several key periods of population change: 80-83, 88-91, 00-05, and 09-13. In this report I break down these indices by depicting three relationships: fall adults to the following summer recruits, summer recruits to following fall adults, and fall adults to following fall adults. The relationship between the fall index of adult spawners to the index of juveniles the following summer is shown in Figure 3. Note the strong positive and highly significant relationship between the numbers of fall adult spawners and the numbers of juveniles that survive to the following summer. This relationship is indicative of the strong role the number of adult spawners (egg production) has on recruitment into the population. Note also the generally lower recruitment-per-spawner in drier years (red years), which is likely the result of a complex of factors related to Delta inflow/outflow and the export of water from the Delta. The population tends to expand (up to 10-fold, one log10 level) with the higher recruitment-per-spawner in wet years and tends to contract with the lower recruitment-per-spawner in dry years. There is also a strong pattern of reduced abundance in the past three decades, starting with a sharp decline in recruits per spawner in the 80’s and 90’s often attributed to the proliferation of exotic clams, the 2001-05 period often referred to as the Pelagic Organism Decline (POD), and the drought periods of 2007-09 and 2012-15. 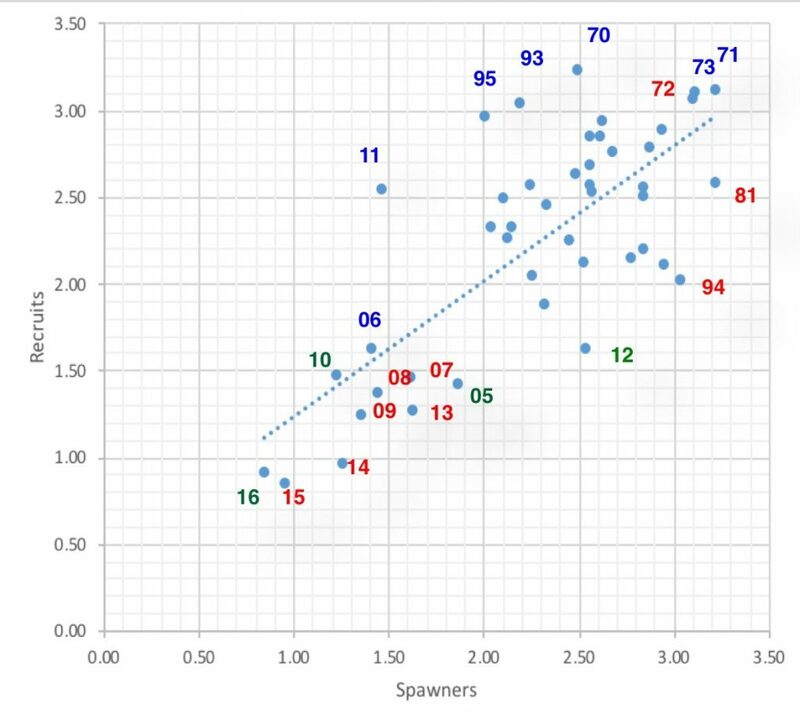 A closer look at these patterns in Figure 3 indicates possible explanations for the overall 50-year pattern of trending lower numbers of spawners and recruits, and recruits per spawner, over time. In the 70’s, the population expanded initially with the abundant 1970 year-class that featured a high number of recruits-per-spawner, followed by another increase with the strong 1978 year-class. The population was sustained by high recruits per spawner through the wet and dry years of the 70’s. In the 80’s and 90’s, recruits per spawner dropped sharply in drier years, while remaining relatively high in wetter years. A sharp drop in the spawning population occurred after the 1980 fall peak (red 81). In the 80’s and 90’s, the population had matching upward (Group B) and downward (Group A) movements that maintained the population into the early 2000’s (00, 01, and 02). Despite low recruits per spawner in the 87-92 drought, the population rebounded in the wet years from 93 to 99. The population then took a sharp drop from the high fall level in 99 to the much lower level in 04 and the very low recruit-per-spawner year 05. Again, that latter period corresponds to the POD and a drier 00-05 period with four normal and two dry years. There was a sharp uptick in recruitment per spawner in wetter 10-11 (Group C) following the dry years of 07-09, but the population collapsed again with very poor recruitment per spawner in 2012. The lower recruits-per spawner in drier years can be explained by low Delta outflows and high exports in winter and spring of drier years. This is best exemplified by comparing Groups A and B in Figure 3. The low recruits per spawner in 05, followed by the drought of 07-09, defined the late 2000’s (Group D). A short recovery period in 10-11 (Group C) was crushed by the poor recruits per spawner in the drought period of 12-16. The poor number of recruits in 15-16 (Group E) is simply a lack of spawners (low eggs) and continuing drought conditions. Figure 3. 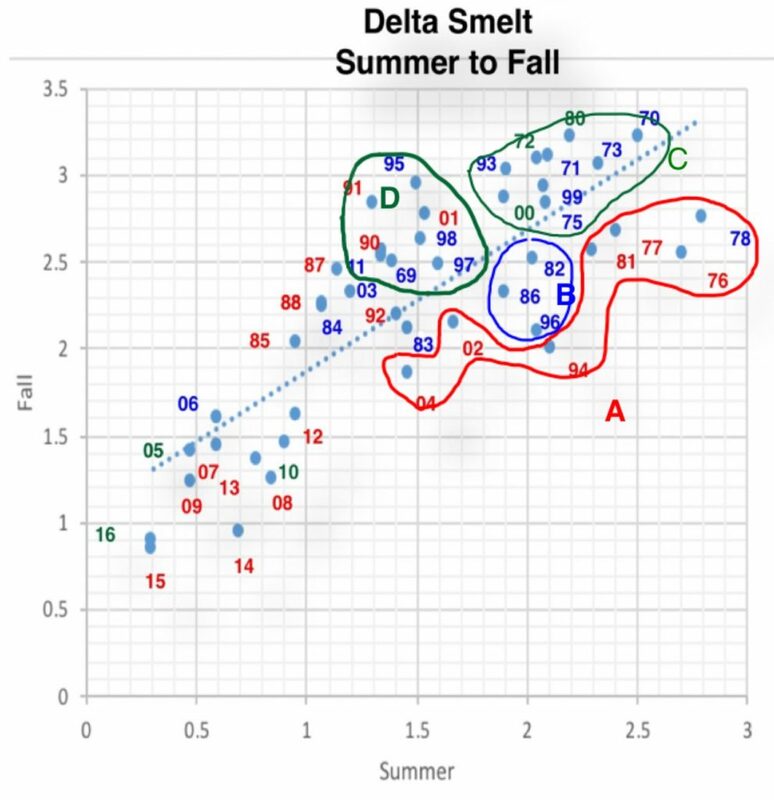 Groupings A to E in Log vs Log plot (Figure 3) of Summer Index of Delta smelt as related to the previous Fall Index of abundance, by year of summer index. Blue years are wet water years (Oct-Sept). Green years are normal water years. Red years are dry and critical water years. Year types are as determined by the California Department of Water Resources for the Sacramento Eight-River Index. 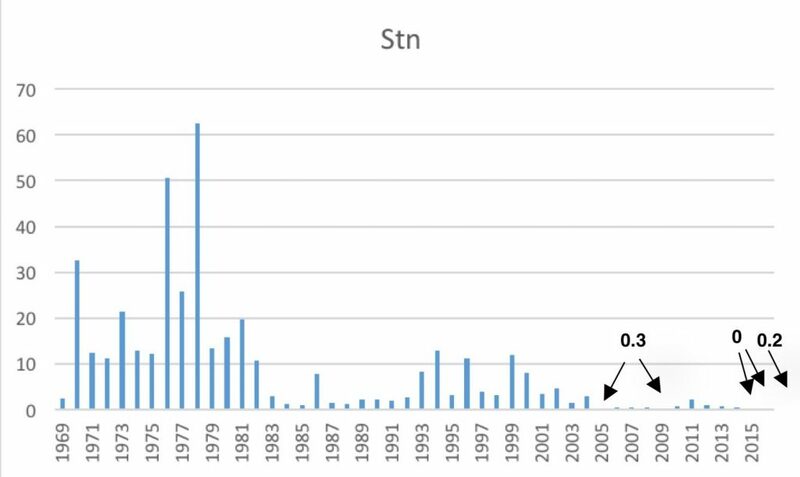 The relationship between summer juvenile production as reflected in the STN index for the year and survival as reflected in the following fall adult FMWT index is shown in Figure 4. The comparison represents the relative survival between summer and fall, most likely reflecting July-September conditions in the Bay-Delta. The strong positive relationship indicates that the number of juvenile smelt in summer determines in large part the population in the fall, adjusted by summer-fall environmental conditions that can significantly affect survival to the fall. Again, Delta inflow/outflow and exports are likely factors in defining the survival relationship, over and beyond the beginning summer numbers of smelt. As in the previous fall to summer relationship described earlier, summer to fall survival is generally higher in wetter years, with notable exceptions. These exceptions are due mainly to the fact that conditions in the Bay-Delta in many summers, regardless of water-year type, are drought-like: there is often little difference between wet and dry year summer-fall conditions. Note the pattern of falling indices over the five decades of the surveys. A closer look at the pattern in Figure 5 indicates possible explanations for the overall 50 year pattern of trending lower numbers of fall survivors from summer juveniles, and fall production per summer juvenile production level index over time. In the 70’s, the population was high and remained so through 1982. Reduced summer to fall production from 1976-81 led to a lower 1982 population. The subsequent declines from 1982 to 1985 have been attributed to the 80s clam invasion, although there was no apparent decline in summer to fall survival. Poor summer to fall survival in 2004 led to a sharp downward population shift. Group A is indicative of poor over-summer survival in high-export dry years. Group B represents very wet years when part of the population is distributed below the survey area. Group C represents moderately wet years under low to moderate Delta exports. Group D includes wet years and three dry years with low summer exports. Near zero 2015-16 summer indices led to near zero fall indices, a pattern indicative of recruitment failure, where summer production is so low that only low numbers remain in the fall. Figure 4. Log vs Log plot of fall FMWT Index of Delta smelt as related to the prior summer STN Index of abundance for that year. Blue years are wet water years (Oct-Sept). Green years are normal water years. Red years are dry and critical water years. Year types are as determined by the California Department of Water Resources for the Sacramento River runoff to the Bay-Delta Estuary (http://cdec.water.ca.gov/cgi-progs/iodir/WSIHIST ). The plot of LogFall to following LogFall indices (Figure 5) indicates strong recruitment in wet years and poor recruitment in dry years. While the prior year or starting abundance remains the dominant factor as in the above relationships, generally higher recruits-per-spawner occur in wet years and lower recruits-per-spawner occur in drier years. The poor recruitment years (81, 05, and 12) led to sharply negative population shifts. Multi-year droughts 07-09 and 12-15 also led to declining year-to-year population levels. Good recruitment years (e.g., 70, 93, 95, and 11) led to strong positive population recruitment. Figure 5. Log vs Log plot of fall FMWT Index of Delta smelt (recruits) vs previous fall index (spawners). Blue years are wet water years. Green years are normal water years. Red years are dry and critical water years. 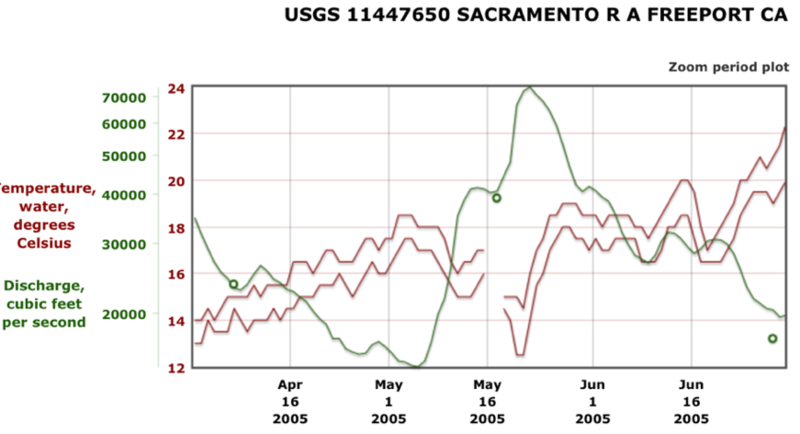 Year types are as determined by the California Department of Water Resources for the Sacramento River runoff to the Bay-Delta Estuary (http://cdec.water.ca.gov/cgi-progs/iodir/WSIHIST ). The population dynamics of Delta smelt are characterized by a strong positive spawner-recruit relationship, modified by wet-dry year conditions. Dry year sequences drive population abundance down, hindering future abundance levels. Wet years generally lead to higher recruitment per spawner. The number of spawners remaining in 2017 may be too low to sustain the population and bring about recovery without extraordinary positive measures such as improved flow conditions, reduced exports, and/or stocking of hatchery-reared Delta smelt. The State of California, after initially complying with the Bureau of Reclamation’s request to remove the Fall X2 protections for Delta smelt,1 has had second thoughts. Instead, the Department of Water Resources has cut exports at Clifton Court to keep X2 (roughly 3800 EC) at km74 (near Mallard Island). The Northern California Water Association stated on September 14: “For the better part of three decades, greater and greater quantities of water were dedicated to instream flows with the expectation that this “silver bullet” of flows, on its own, would solve the diverse assortment of fish mortality causes. The result, on the rivers and streams where this was the primary or only action used to promote survivability, was generally unproductive.” This statement is so misleading and untrue. It is outright propaganda. Streamflow is absolutely necessary to maintain salmon, steelhead, sturgeon, and smelt throughout the Central Valley, and reductions in streamflow have been directly related to fish mortality and population abundance. The truth is that each year the state and federal water projects in the Central Valley keep squeezing more and more water from the system. There is no better example than in 2017, a near record water and snowpack year. Even in this very wet water year, water managers are saving water for use in future years rather than applying it as required for the fish. Their excuse is that they must save the water to preserve the cold-water pool in Shasta reservoir for the summer and fall salmon spawn. While that is a true need in drier years, it is not in wet years when Lake Shasta fills. Water users got full allocations this year. Delta exports reached a near record 6.2 million acre-feet (MAF) of water in Water Year 2017. So instead of keeping river flows up to meet salmon needs with water that users did not need, project managers saved the water for next year’s use. While saving Shasta storage for next year is not a bad thing, saving this year’s fish water for next year’s contractor allocations is certainly not good for fish species near extinction. How is the fish water saved? The basic approach is to limit Shasta releases and violate fish water temperature standards in the 200-miles of the Sacramento River down to the Delta. 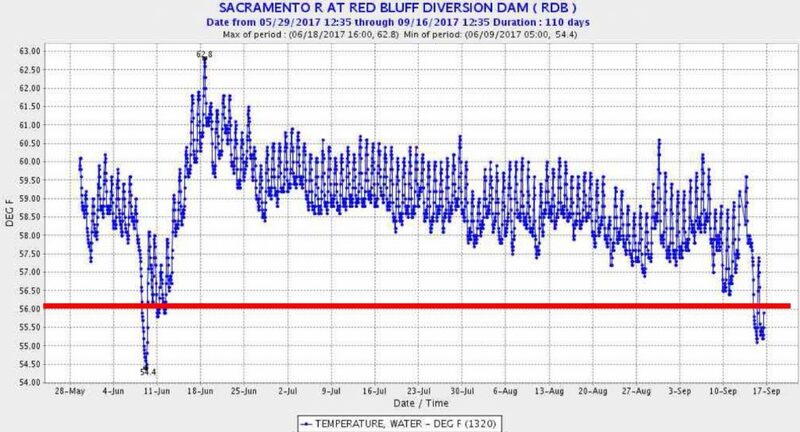 The standards require maintaining spring-to-fall water temperature at Red Bluff at 56oF and at 68oF between Red Bluff and the Delta. It takes releases of cold water from Shasta to maintain the Red Bluff standard. In the lower river, it is the flow rate that maintains the standard. With Sacramento River contractors receiving their full allocations and the Delta diverters getting all the water they needed in 2017, there was an overt effort to save the water in Lake Shasta at the expense of the salmon. The water managers and resource agencies started by moving the Red Bluff 56oF standard compliance point upstream 33 miles to Balls Ferry, leaving over half the upper 60-mile salmon spawning reach without protection. That action is for dry years, not wet years. The combination of lower and warmer Shasta/Keswick releases resulted in excessively high water temperatures near Red Bluff (Figure 1). 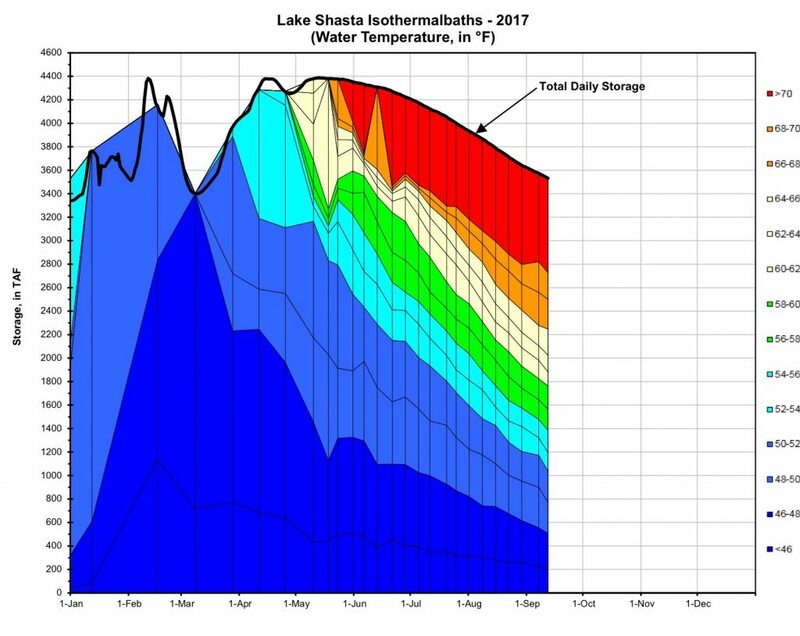 Lower Shasta releases and lower flows below Red Bluff led to low flows and high water temperatures 120 miles downstream at Wilkins Slough during the summer (Figure 2). 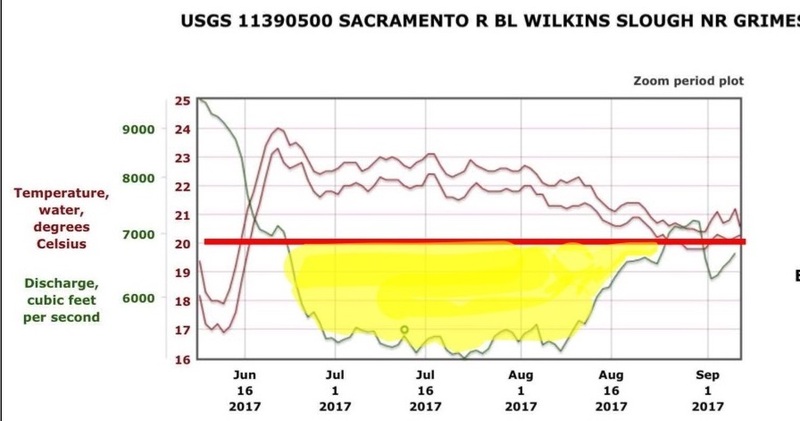 By ignoring the water temperature standards, water managersheld approximately 300 thousand acre-feet (TAF) of extra water in storage at Lake Shasta (the amount in yellow area of Figure 2). The standards were also exceeded 40 miles further downstream at Verona (Figure 3); again, the amount that would have been necessary to maintain the standard was about 300 TAF. The effect translated to higher water temperatures 30 miles further downstream in the Delta at Freeport (Figure 4). Was the 300 TAF of storage saving necessary to preserve Shasta’s cold-water pool to protect salmon in the upper river spawning area over the summer and into the fall? No, and certainly not at the expense of salmon, steelhead, sturgeon, and smelt over the summer in the river, Delta, and Bay. First, there was sufficient cold water to maintain the standards through the summer, regardless what the agencies say or their models predicted. 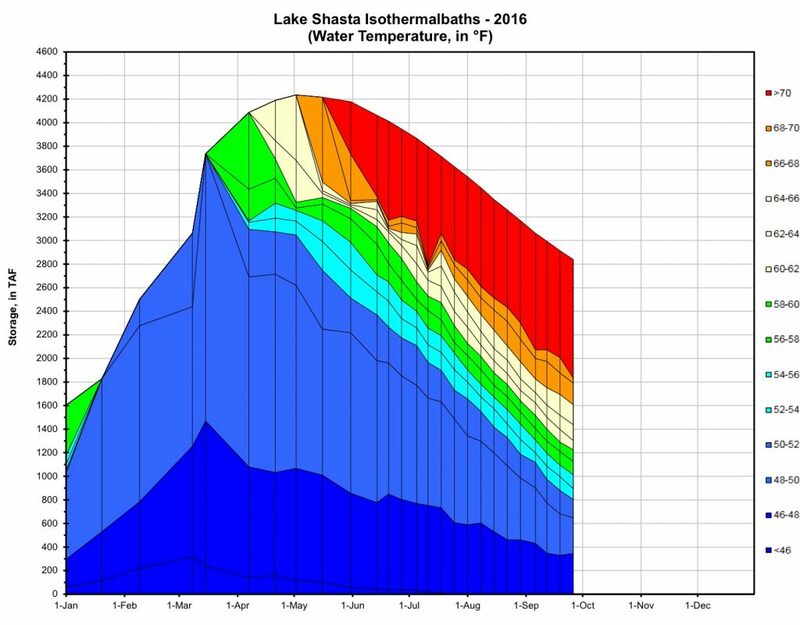 There was 400 TAF more water in the Shasta cold-water pool than in 2016 (Figures 5 and 6). Standards had been maintained in the two previous wet years, 2006 and 2011. Had water managers released the water for fish in 2017, the end-of-September storage would have been 3.1 MAF instead of the projected 3.4 MAF. The 3.1 MAF is adequate and within project goals. It is twice the end-of-September storage of 2015, and 10% higher than 2016. Second, if the 300-TAF was too high a price, some or all of it could have been allocated from the over 8 MAF of water diverted from the Sacramento River and the Delta for water use. Third, if a shortage of the cold-water was a concern, less warm water from the Trinity-Whiskeytown trans-basin diversion could have been delivered to the Sacramento River, or less peaking hydropower generation at Shasta Dam could have occurred: both are known factors in cold-water pool depletion. In summary, water project managers in the Central Valley saved 300 TAF by not meeting water temperature standards for the Sacramento River in summer 2017. In the whole scheme of 2017 water management it seems “small potatoes” (Figure 7), but maintaining the long-held standard is important for salmon. There was no valid excuse for not meeting the water temperature standards. Salmon, steelhead, sturgeon, and smelt suffered unnecessarily from the violation of the water temperature standards. Figure 7. Water Year 2017 flows in the Sacramento River at Wilkins Slough. 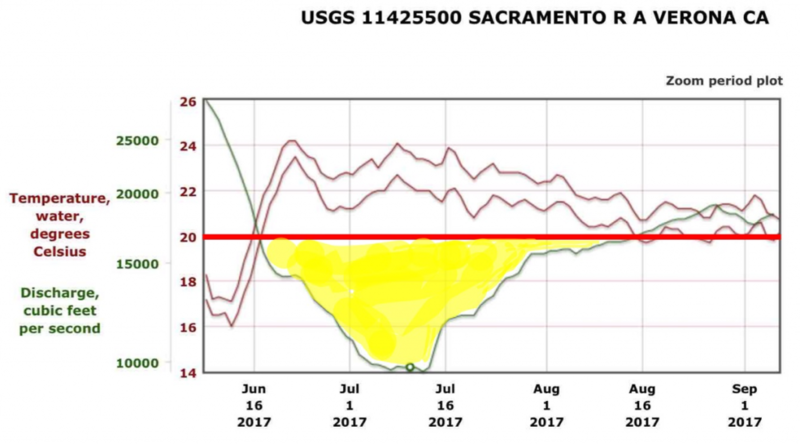 Near 300 TAF of Shasta storage was saved by reducing flows below the norm in summer (red circle). Base chart source: USGS.